You. Me. Ride This Crazy Train - Adventures and Observations on The GO: A special quad just for you. And you. Annnd you. I've been a GO rider for 20 years now and it seems that lately this is happening more often. What's going on with everyone? Do they all go into "stupid" mode when they get on the train? I've been riding the train for 23 years and I think it's getting worse and worse, just in the last 5-10 years or so. The "me-first" entitlement is very strong with some people. I don't get it. It costs NOTHING to be polite and considerate of fellow passengers. This is becoming more frequent, that and people leaving their trash on trains. 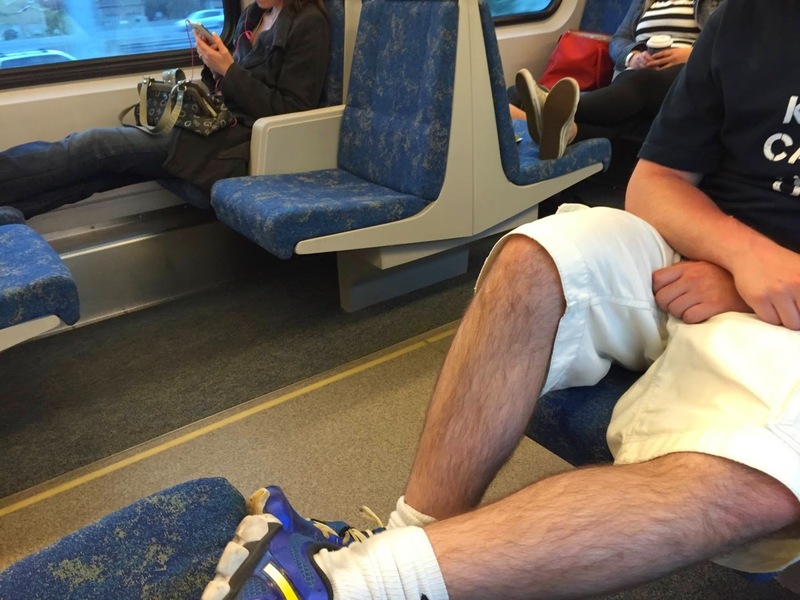 Go should start aggressively speaking out about this, it is NOT socially acceptable to put your feet on the seats. These idiots would not want to sit on a seat knowing someone had their dirty shoes on it. I saw an elderly couple even doing this so age is not an reason either. I took my mom on the train a couple years ago. She did put her feet up briefly. Then I asked if she would pay for new white capris for me, for when I sit in the shoe dirt. She removed them. Of course, we shouldn't have to ask people to act like responsible human beings, but if we start actually breaking everything down to costs, then it makes actions more real. I'd never have to say that to my mum because she wouldn't dare put her feet on the seats. And if she did, I'd SLAP her. Keep in mind, it all depends on tone. Plus, that is the bare-bones accounting of the incident. My parents and I get along really well (heck, I am heading to their place on Friday for a week) and as we get older, we are freer in how we talk to them. It was actually a special occasion. She had rubbed prescribed medication onto her legs and left them up. Normally she wouldn't dream of doing something like that. In fact, had the tables been reversed, I would have been the one reprimanded. What about under the Quads? I remember seeing a drunk who was passed out UNDER the seats a couple of years ago. I remember thinking "At least his feet were not on the seats." I wish I had a smartphone back then that would of been a great photo. What a courteous drunk. Gold stars! This is why we DON'T NEED QUADS on these trains. They encourage the worse BS imaginable.